Swing aficionados generally use words like "happy" and "fun," when describing their dance, and Lindy Hop the original style of swing, is often referred to as "an outward expression of an inner joy." Sometimes silly, sometimes cool, it's a dance that lifts the spirits. And to those that catch the bug ( the "Jitter"-bug, that is), it's an addictive thrill. So begins Tamara Stevens new book Swing Dancing (2011, Greenwood Press). Part of the "American Dance Floor" series, Swing Dancing is almost certainly the first textbook to focus on the history of lindy hop. It's notable because it was written by one of its practitioners, Tamara Stevens, a swing dancer, teacher, and co-owner of the Pasadena Ballroom Dance Association since 1983. From the beginning, it is obvious you are reading a history of our dance written by someone who has lived and breathed lindy hop for decades. When she writes about the passing of Frankie Manning, you can sense how well she understands our collective grief. And the internecine battles over "Hollywood" and "Savoy" style, "Westies" versus lindy hoppers, and other in-house arguments would be difficult for anyone outside of the cult to penetrate. It was thrilling reading an academic book about lindy hop from someone who "gets it." I found the most interesting part of the book to be the roots of lindy hop, which are wide-ranging and must have been very difficult to research. From the African slave trade to the Americas, Stevens writes that there must have been the beginnings of the influx of African dance movement into American culture. Stevens describes the "ring shout," "cake walk," and "buck dance" practiced by both slave and free African-Americans, as paving the way towards what we know of as swing. Meanwhile from more European roots came the jib and the horn pipe dances, that African-americans certainly observed, imitated, modified, and blended with Afro-centric movement. The troubling history of black-faced minstrelry was a form of entertainment I knew very little about. Stevens makes a strong argument for how these typically racist caricatures of African-americans by white entertainers also served to disseminate Afro-centric movement and rhythms to a wider public. The book then examines the birth of jazz and how from its beginnings it was music for dancing, not just listening. Stevens traces the complicated evolution of jazz music and social dance through the years, from ragtime to big band swing to bebop. For those unfamiliar with the various manifestions of "swing dancing," this book may be helpful in unpacking the differences between "west coast swing," "east coast swing," "western swing," "lindy hop," "balboa," "shag" in its various forms, and other less well-known swing variants. Stevens peppers her descriptions with quotes from various practitioners that she interviewed, which must have been difficult to collect. Stevens concludes the book describing what she calls the "Second Era of Swing" from the late 1990s to early 2000s. As someone who started dancing "post-'Swing Kids'" but "pre-'Gap Ad'", it was interesting and at times painful re-visiting all of the cultural moments when this social dance suddenly became a craze again. The book includes all of the modern manifestations of lindy hop, from the national and international competitive circuit, to "exchanges" and swing camps, and the growing use of the internet as a means of connecting dancers and disseminating information. Yehoodi.com gets a nice mention on page 184. There are some aspects of the lindy hop movement that I wished were better represented. The spread of lindy internationally to places as far-flung as Cambodia and Brazil is one of the most exciting developments in our recent history. Stevens spends some time looking at how lindy came to Sweden and the birth of the Herrang Dance Camp. But there are many more amazing stories to tell about the global lindy hop movement. Just look at lindy hop scene in Korea that has grown in just a few years into literally thousands of avid lindy hoppers. But of course, there is only so much you can cover in a small book. For all of the information it contains, Swing Dancing is actually a quick read at 192 pages. For anyone who takes lindy hop seriously, or just curious about the original swing dance that started it all, Swing Dancing is a must read. 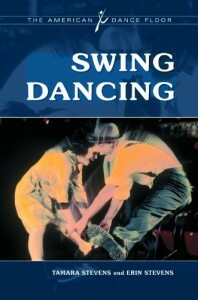 Swing Dancing is available at Amazon and Barnes and Noble.